A few decades ago the Lalita Sahasranama (1,000 Names of the Divine Mother) was not being chanted by the devout. Many believed if the Sahasranama was not chanted properly, it would result in the Goddess being angry and great harm would befall them. The priest class also scared the common man. 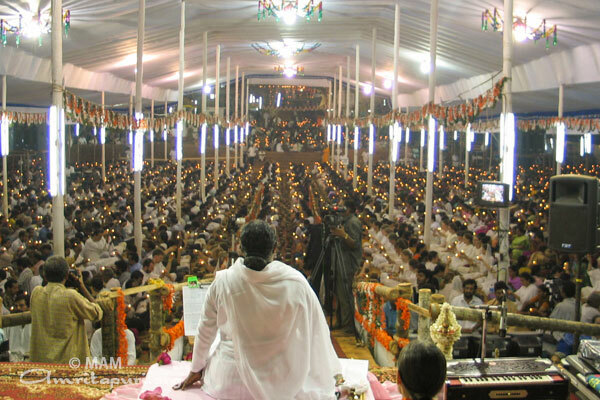 Amma reassured her devotees that it is not necessary to call one’s own mother according to musical principles. Devi is the Divine Mother, mother of all. The mother doesn’t mind if the child’s cry is not in the proper musical pitch or tone; what she is listening to is the intensity of the feeling, in her child’s heart, resonating in the cry. Apart from saying this, Amma has made sure that her children are thoroughly exposed to the benefits of chanting the Lalita Sahasranama. At all the Brahmasthanam festivals, thousands of devotees chant the 1,000 names five times a day. Amma made Lalita Sahasranama so popular. As a result we can see thousands of Amma’s children from various countries, all around the globe, chanting the Lalita Sahasranama daily. So far (June 2015), nine lakhs (9,00,000) copies of the book has been printed in various languages for the use of the daily chant. Amma has chosen Lalita Sahasranama archana (and chanting) as a daily practice for relief from the perils in life and for spiritual progress. 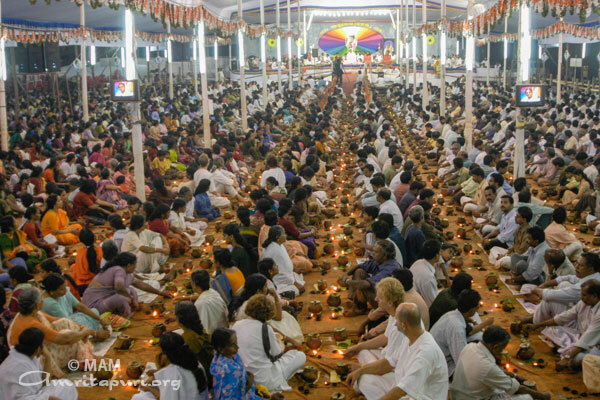 In Amritapuri, there is dawn-to-dusk chanting of the Lalita Sahasranama. Apart from this all the monastic members and other residents of Amritapuri chant the Lalita Sahasranama at least once a day as part of their personal sadhana (spiritual practice). Amma also encourages her householder devotees to chant the Sahasranama daily.